The Kiliani-Fischer Synthesis is a method for extending a carbohydrate chain by a single carbon. The Ruff Degradation is a method for shortening a carbohydrate chain by a single carbon. The Kiliani-Fischer Synthesis involves addition of cyanide ion to an open-chain aldehyde (in the case of aldoses) which is then partially reduced and then hydrolyzed to give a new aldehyde. In the absence of chiral reagents, a mixture of diastereomers will be produced. The Ruff Degradation is a method for peforming the reverse reaction. A sugar is oxidized to a carboxylic acid with bromine water, and then oxidation with iron sulfate and oxygen liberates CO2. The cyanide ion (CN–) can be a very useful tool for extending carbon chains by a single carbon. A familiar example is the reaction of cyanide ion with primary alkyl halides in a nucleophilic substitution reaction (SN2). The resulting nitrile can then be hydrolyzed with aqueous acid to give a carboxylic acid (which in turn can undergo many further reactions). In this case, and almost all others, creates a new chiral center. In the absence of any chiral reagents, the result will be a mixture of two configurations (R and S) at the cyanohydrin carbon. For example, take the simplest sugar, the three-carbon aldose glyceraldehyde (below, we show D-glyceraldehyde). As with the example above, attack of cyanide ion on the aldehyde results in a cyanohydrin, extending the length of the longest carbon chain from three to four. It also creates a new stereocenter, giving rise to a mixture of products with (R) and (S) configurations. Since the stereocenter at the C-3 carbon (R) remains unchanged by this process, in the absence of any chiral reagents this process results in a mixture of diastereomers: (2R, 3R) and (2S, 3R). 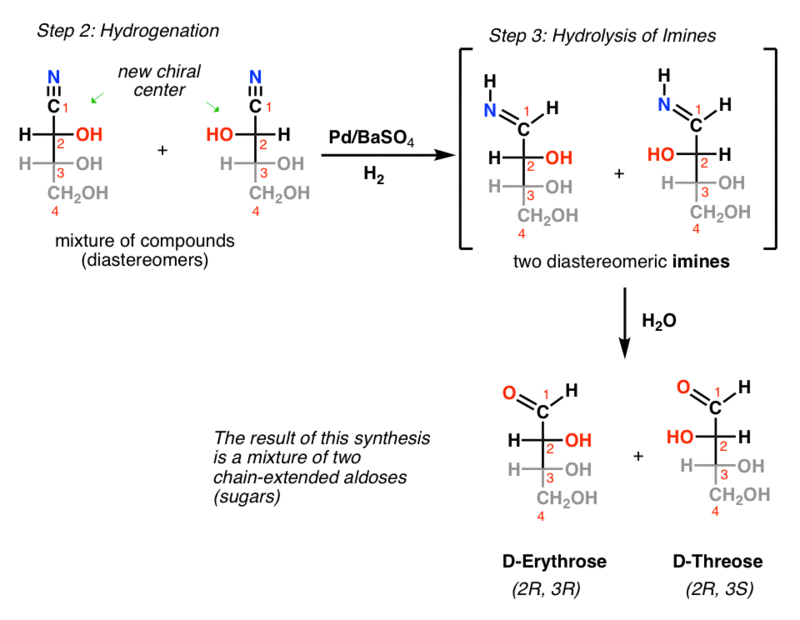 While these cyanohydrins can be hydrolyzed to carboxylic acids (with aqueous acid), it’s often more useful to adopt the process for the creating of a new aldose. Using a poisoned catalyst (Pd/BaSO4) in the presence of hydrogen gas (H2) will reduce the nitrile to an imine. In the presence of water, the imine will then be rapidly hydrolyzed to an aldehyde. It’s also possible to go in the reverse direction, where an aldose is reduced in length by one carbon. The procedure for going in this direction is called the Ruff Degradation, a procedure which dates back to the late 1890’s. 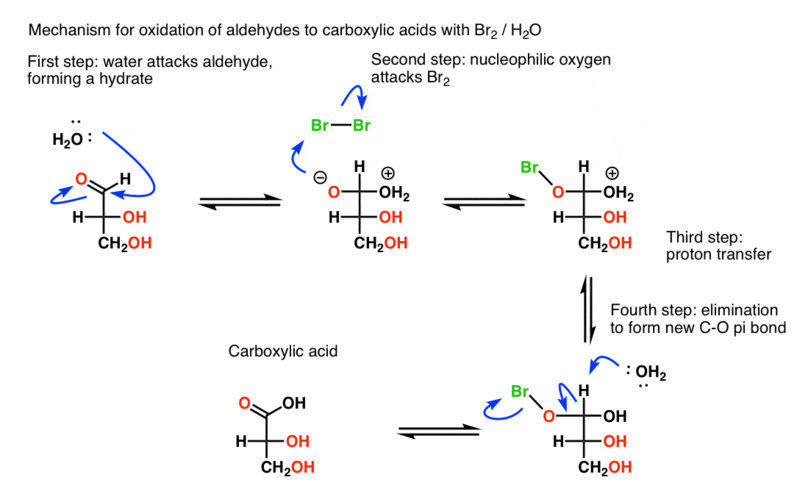 In the first step, the aldehyde is selectively oxidized to a carboxylic acid by bromine (Br2) and water. Note that the secondary and primary alcohols are not oxidized here! Most courses don’t generally go into the weeds as far as the mechanistic details, but we’ll have a stab at the Br2/H2O reaction down in the endnotes. However, they do have great historical significance, in that they are two important tools that Emil Fischer used to determine the structure of glucose and other aldohexoses, an effort that won him the 1902 Nobel Prize in Chemistry. Just to give you a taste, Fischer was able to show that D-glucose and D-mannose each formed the same product upon Ruff degradation (D-arabinose) indicating them to have opposite configurations at C-2 (epimers). Further Ruff degradations gave D-glyceraldehyde, which established the stereochemistry of the chiral center on C-5. At some point we’ll go into further discussion when we investigate the Fischer Proof of the structure of glucose. The first step is formation of a hydrate from addition of water to the aldehyde. The zwitterionic form (where there is O- ) is more nucleophilic than the neutral form, so here it’s shown acting as the nucleophile to attack Br2. At some point the OH2+ is neutralized ; here it’s shown occurring after attack on Br2, but it could occur earlier. Note that there is now a good leaving group on oxygen (Br). A weak base (H2O) then deprotonates C-H, which forms a new C-O pi bond, with loss of Br (-) leading to formation of the carboxylic acid. We won’t go into the mechanism of the Ruff degradation here, but I will point out that iron and H2O2 are the ingredients of the Fenton reaction, a process that creates a hydroxyl radical.